Our Hosted Exchange service combines the leading messaging service based on Microsoft's Exchange Server 2013 with our Rock Solid Cloud Network. You need a fully synchronised, enterprise level, email and calendar service across your whole organisation. You want email, shared calendars and shared contact lists available to your entire workforce both in the office and when working remotely. You don't want the hassle of managing an internal mail server. Improving your staff communication and collaboration whilst reducing the burden on your I.T. support team. You are a smaller organisation looking for the enterprise level features and benefits of exchange within a cost effective, affordable package. As standard we host every mailbox on three separate Exchange Servers. Two in our Datacentre 1, and a third in our Datacentre 2 based at a different geographical location. We also regularly back up all mailboxes for unsurpassed resilience. We understand how critical your mail service is and have a number of proven migration methodologies. Our easy-to-use control panel and our 24/7 UK Fast & Friendly Support™ will ensure that any existing email services are seamlessly migrated across. Our network is highly resilient with multiple levels of redundancy. In the unlikely event of either a hardware or network failure your mail will seamlessly route through an alternative network.  Hosted Exchange is a cloud based email hosting solution which allows users to have access to their emails, calendar, tasks and contacts from any device. ‘Push’ technology allows you to access emails in real time from your smartphone or tablet. For business professionals Hosted Exchange can make your business more efficient and productive. Our Hosted Exchange package operates on a month-to-month basis. Which version of Hosted Exchange will I have? We offer Hosted Exchange 2013 and as an optional extra you can have Outlook 2013 included. How often are my emails backed-up? All emails are backed up on a daily basis. Do I get spam filtering as standard? Yes. Our award winning spam filter will remove 99% of spam and virus emails – providing you with peace of mind and added reassurance. Can I keep my domain and email addresses? Yes of course. There is no need to change your current email address and domain name. The Intrahost support team will help you every step of the way to set up your Hosted Exchange account. Do you support handheld devices? Yes. Hosted Exchange 2013 excels on handheld devices including: iPhone, BlackBerry, Google Android, Windows Mobile and other smartphones. Hosted Exchange also works well on laptops, tablet computers, Apple Macs and desktop PCs. Is Hosted Exchange available on a wireless connection? Yes. Hosted Exchange works on a wireless connection including 3G coverage. Anywhere you can obtain an Internet connection the Hosted Exchange is available. How reliable is Hosted Exchange 2013? Our Hosted Exchange package includes a 99.9% SLA. This service is dual hosted. In the event of an outage, all traffic will be redirected to our secondary datacentre.